Sara Bareilles screen printed Tour Poster silkscreen, limited edition. 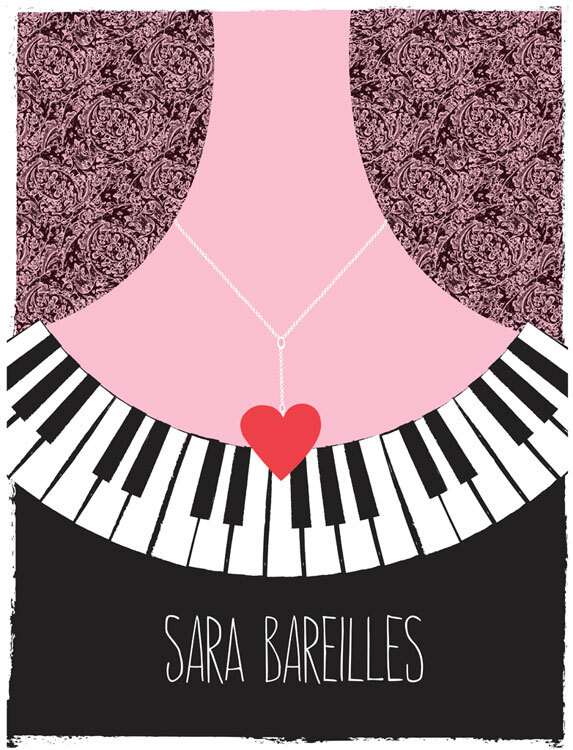 Hand screen printed 2011 Tour Poster for Sara Bareilles, included in a collection of merch for her 2011 tours, including this tour poster, a tank top design and a tote bag too. 3-color hand silkcreen printed with hand mixed midnight black, soft pink and love-red, acrylic screenprinting inks. Edition: 250 posters went to Sara for her Summer 2011 Tour and an Artist’s Edition of only 50 posters will be available for sale here after the start of the tour. All 300 limited edition posters are signed & numbered (by me, strawberryluna) 18 x24 inches (45.7 cm x 61 cm). Paper: archival Cougar, White 100lb cover weight.